The country’s infrastructure is aging, and our water distribution infrastructure is no exception to that trend. According to the Environmental Protection Agency, 30 percent of the pipes serving populations of more than 100,000 people are 40 to 80 years old. The U.S. loses about 6 billion gallons of water a day, according to the American City & County. And worldwide water loss costs utilities an estimated $14 billion a year. These realities – and the facts that California and other areas in the West are now experiencing water shortages due to drought and the U.S. Government Accountability Office indicates 40 states will have at least one region that will face a water shortage in the next decade – all point to the need for more efficient water solutions. AT&T has been on the forefront of delivering smart water solutions, says Mobeen Khan, associate vice president of industrial IoT at the communications services provider. Working together with IBM and Mueller Water Products, AT&T is making possible a solution that can help detects leaks in water mains. This is important because, as noted above, the water pipe system in this country is old (most pipes were installed in the 1950s), but the cost of ripping and replacing this infrastructure is tremendous – typically in excess of $1 million per mile. So a more tenable solution is to monitor pipes for leakage, so technicians can address these problems, which sometimes go undetected for hours or days, as they occur. AT&T, IBM, and Mueller Water Products came together about a year ago after the federal government issued an invitation for companies to showcase their smart city solutions. Initially, the joint solution was just a proof of concept for the U.S. Department of Commerce’s National Institute of Standards and Technology program, with related trials in Atlanta, Las Vegas, and Los Angeles. Indeed, the Las Vegas Valley Water District leak monitoring project is a water conservation showcase site for The Global City Teams Challenge. It is one example of a collaborative effort by project teams, working on innovative applications of Internet of Things technologies within a smart city/smart community environment. While AT&T, IBM, and Mueller Water Products initially put together their joint solution as a demonstration project, the companies are now commercializing this smart water solution. That solution – which can address use cases for large companies, municipalities, or even water parks – leverages acoustic technology provided by Mueller Water Products. Acoustic sensors placed along the pipes trigger alarms when they sense sound changes that may indicate leaks. AT&T’s LTE network carries the sensor information to computing resources running a water management application from IBM. “Within the U.S., this is a big deal because our water infrastructure is old and when there is an issue – a leak – it takes time to detect and fix that,” says Khan. Return on investment of this technology is fast, he adds, noting that the solution can be offered as a managed service or purchased. Smart water solutions are, of course, just the tip of the iceberg when it comes to leveraging machine-to-machine technology and the Internet of Things. 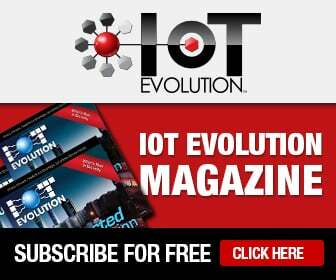 AT&T recently demonstrated a selection of other IoT solutions including Cargo View, Connected Jukebox, and Smart Bin. And the company this year alone has struck IoT agreements with more than 136 companies across numerous industries. New solutions that allow for the conservation of resources – be they utility resources like water or electricity, or things like parking spaces – all have cost and operational benefits, says Khan. And while municipalities have begun their exploration of such solutions via trials, he adds, very soon we will start to see more cities deploy these kinds of solutions permanently as managing the limited water supply is a key area of focus in implementing smart city technologies. AT&T Cargo View – AT&T Cargo View with FlightSafe is an IoT solution for managing supply chain assets. It gives businesses a deeper look into their shipments. Cargo View can track and monitor precious cargo on land, sea and in the air with a single device. The small Cargo View device is placed in shipping packages to monitor temperature, pressure, light and shock through built-in sensors. The Connected Jukebox – TouchTunes is one of the largest interactive music and entertainment console manufacturers. More than 71,000 bars and restaurants across North America and Europe feature the company’s music consoles. This company uses IoT solutions to remotely update its jukeboxes with the latest songs, menus, and themes. And patrons can select and play songs using the TouchTunes mobile application on their smartphones. The Smart Bin – A smart trash receptacle developed at the AT&T Foundry for IoT innovation center in Plano, Texas, is a fully connected, secured, and functional shredder that can send helpful information to a waste management company. It sends out a wireless signal to a dispatcher when it needs to be emptied. It can also alert the dispatcher when pickup isn’t necessary, to save fuel and other expenses. It even sends notifications when a bin has moved from its original location, to prevent theft.